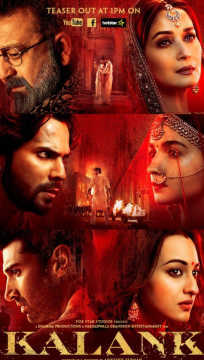 The song Kalank (Title Track) from the film Kalank(2019) released on 30 Apr 2019 with a duration of 05 minutes and 11 seconds. Kalank (Title Track) is picturized on Alia Bhatt, Varun Dhawan, Kunal Kemmu, Sonakshi Sinha, Aditya Roy Kapur, Sanjay Dutt, Madhuri Dixit and Deepak Qazir. The lyrics of Kalank (Title Track) are by Amitabh Bhattacharya. It has been sung by Arijit Singh. The music has been composed by Pritam Chakraborty.